In our Bollywood dance classes, our students learn the importance that every part of the body plays. One of the most important body parts in Bollywood dancing is the hands. Hands are used to tell a story, and there are many movements in Bollywood dancing that are almost like sign language. They help the viewer understand more about the story and help convey some of the emotion. These hand gestures are called “mudras” and there are dozens and dozens of them that a truly great dancer must learn. Mudras using one hand are known as Asamyukta hastas. With a single hand, you can inform the viewers of the dance about animals, character traits, or even setting a scene. One of our favorite single handed mudras is “hood of a snake.” To make this gesture, you hold your hand up with the fingers straight up and close together. Then, bend the tips of the fingers slightly to form the hood of the snake. These are called Samyukta mudras. Again, these two-handed gestures can tell the audience a lot without every saying a word. There are gestures for people, places, animals, and moods to set the scene or tell more of the story. One great two-handed mudras is the “auspicious sign,” which is crossing the hands at the wrists with the fingers straight up. It’s a sign that the character or dancer is full of promise! Want to learn more about using your hands to tell a story? 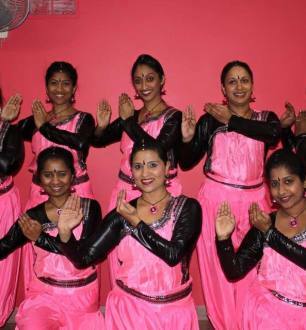 Sign up for one of our Bollywood dance classes today! We have classes for all ages and experience levels so you can find the one that’s right for you. Click the button below to get started! Sign Up for Bollywood Dance Classes!